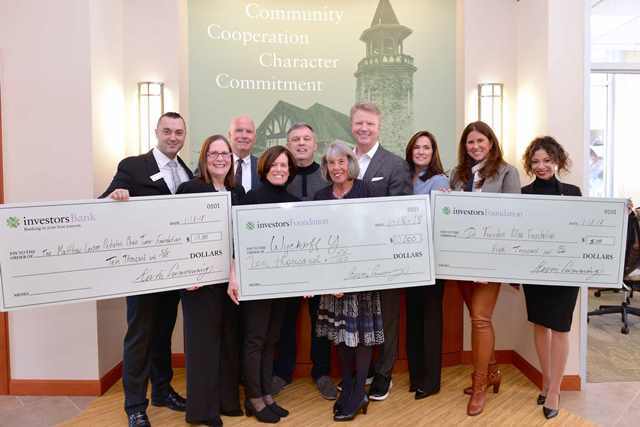 Englewood, New Jersey – Investors Bank and the Investors Foundation is awarding $25,000 in grants to three community-based, not-for-profit organizations on behalf of professional sports and broadcasting icon Phil Simms. Mr. Simms, along with former NFL quarterback and sports broadcaster Boomer Esiason, are spokesmen for Investors Bank. The bank and Mr. Simms share a long-term commitment to supporting and serving local and national nonprofits. The grants were presented during ceremonies held today in Investors Bank’s Englewood branch at 108 Engle Street. Mr. Simms has generously served and assisted these three non-profits, among others, since he joined the New York Giants football team in 1979. The grants were awarded to the Matthew Larson Foundation for Pediatric Brain Tumors, which is also known as the IronMatt Foundation, the Dr. Theodore Atlas Foundation, and the Wyckoff Family YMCA. Mr. Simms and his family have unique relationships with each of these organizations. For example, the Simms are friends of the Larson family, whose son, Matt, courageously battled a rare brain cancer for five years before losing the battle. Also, Mr. Simms has been actively involved with the Dr. Atlas Foundation since its founding over 21 years ago. Mr. Simms brought his passion, enthusiasm and energy to the Wyckoff YMCA’s major projects, which include expanding their existing facilities to opening branch locations in adjoining towns. Mr. Simms has helped each organization thrive by sharing his time, talents and resources. He and his wife Diana serve as honorary members of the IronMatt Foundation board. The Simms family assists the IronMatt Foundation by building awareness of the organization’s mission of funding scientists who are researching pediatric brain tumors and helping children and families affected by this disease. The Dr. Atlas Foundation serves families and individuals on Staten Island and elsewhere, especially young people, whose needs are often forgotten or overlooked. Mr. Simms draws much satisfaction from his support of the YMCA, which serves friends and neighbors in Wyckoff, as well as many people in nearby communities. Investors Bank is on multi-year journey of growth, and in 2017 Phil and Boomer joined the team. As spokesmen, they have joined together to convey positive messages about Investors Bank, its brand and its employees. They have appeared in the Bank’s television and radio commercials, been featured in print and out-of-home advertising and participated in a series of ten online web videos. The video content, which is moderated by renowned sports journalist Bonnie Bernstein, focuses on a range of topics from leadership to community, coaching, trust and competency.